This a 1975 1000 CC Triple Factory Endurance racer. Build to succeed the 750 SFC racers this bikes featured special frames. Marco Luchinelli raced one of these bikes at the 24 Hours of Le Mans that year. 4 of these bikes where ever build by the Breganze factory and 3 of them survived. 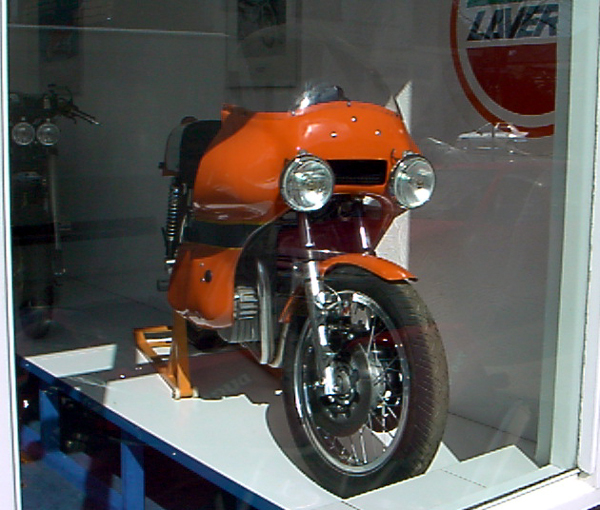 We had the opportunity to drool at 2 of them while visiting THE Laverda Specialist in Holland and the rest of the Globe; van Dijk Motorcycles in Driebergen Holland. I don't have shares in this place but I just like Gijs van Dijk and he is a wizard with Laverda so I'll put his name out there as much as possible when we are talking Laverda's. Next to that its that kind of MC shop that unfortunately disappeared around here the past 15 years so it makes him the last of the Mohecans.